Size: 5.9" x 3.0" x 0.65"
Dismantling the Hewlett Packard 30b Business Professional is different from most other calculators. 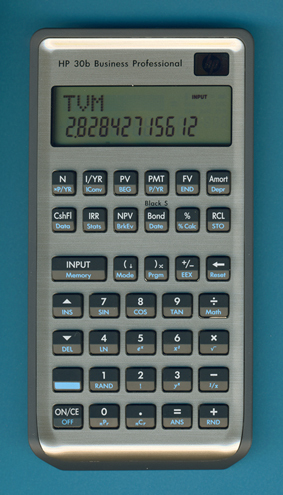 The battery cover extends over 80% of the calculator surface and allows access to three screws. The remaining 2 screws are hidden under two rubber feet. Inside we located a pretty common construction with a single printed circuit board (PCB). The PCB hides the single-chip calculating circuit under a small protection blob of black epoxy and drives the graphing display with a heat sealed fine-pitch connector. Don't miss the related SmartCalc 300s introduced already in March 2009. © Joerg Woerner, May 16, 2011. No reprints without written permission.